Wildlife has four basic needs: food, water, nesting places, and cover. The cover in a yard is what helps to protect them from the elements — heat, cold, rain, snow, wind — and predators. Wildlife needs to feel sheltered and safe and will assess the display of possibilities in your yard before visiting it. Cover takes many forms: Trees, dense shrubs, tall grasses, rock and brush piles, hollow logs, a stack of firewood, and even water, are all places where animals can hide from predators and shelter from the weather. You may not be able to provide all of that, but the more choices you offer, the more species you’ll attract to your yard. Grasses provide cover for dashing into when an animal feels threatened. More than that, many animals, including rabbits, doves, quail, some songbirds, and rodents, live and nest in grasses. In winter, snow-covered grasses have an insulating effect and help to warm animals living beneath it. Add a brush pile. It needn’t be large, and it can be hidden in the farthest corner, behind some shrubs, if need be. It will provide something for nearly every animal. Woodpeckers will pick insects out of the decaying wood. Butterflies may spend the night there, tucking themselves into crevices. Some mammals and birds will nest there. It’s a safety net for an animal fleeing a predator. A brush pile isn’t a compost pile or a stack of wood. Start it with fallen or cut limbs. Add to it everytime you cut tree limbs or shrubs. Don’t pack it tightly, let it be airy and a bit messy; all the many openings are ways for wildlife to enter. As it grows, more and more animals can make use of it. A woodpile is different from a brush pile. It’s a neat stack of logs. It doesn’t need to be very wide, but at least 3 feet (91 cm) high. Lay each level crosswise to the one below. It helps to cover just the top with a tarp to keep rain from pouring down through. Erect it in a shady spot near a butterfly garden. Butterflies and moths may find it convenient for resting or roosting overnight, and other wildlife will use it however it suits them. A pile of rocks, any size or shape, will provide crevices for insects and other small animals. Its surface is also a basking spot for cold-blooded species because rocks quickly absorb the heat of the sun. Some wildlife can’t control their body temperature; it’s always the same as the air around them. Those animals — toads, frogs, snakes, turtles, insects, and others need warmth to generate muscle activity. At night, when it cools off, their body temperature drops and muscle activity becomes sluggish. So, the next day, those warm rocks offer a nifty heating pad, of sorts. Meanwhile, under the rocks are lower temperatures for animals wanting to stay cool. Keep your yard a bit messy. To the extent you can, let plant and leaf litter stay where it falls. If falling leaves become a bit too deep in the fall, use your mower to turn them into mulch, and then scatter it in plant beds. Mulch provides insulation for plant roots, but also some insects use it for food, shelter, and laying eggs. Trees provide spots for nesting, resting and hiding. Birdhouses, depending on the size of the entry hole, may be used by songbirds, squirrels, owls, or even opossums. Leafy host plants in flower and vegetable gardens feed butterfly caterpillars while camouflaging them from predators. Shrubs provide small limbs to perch on and leaves to hide behind. 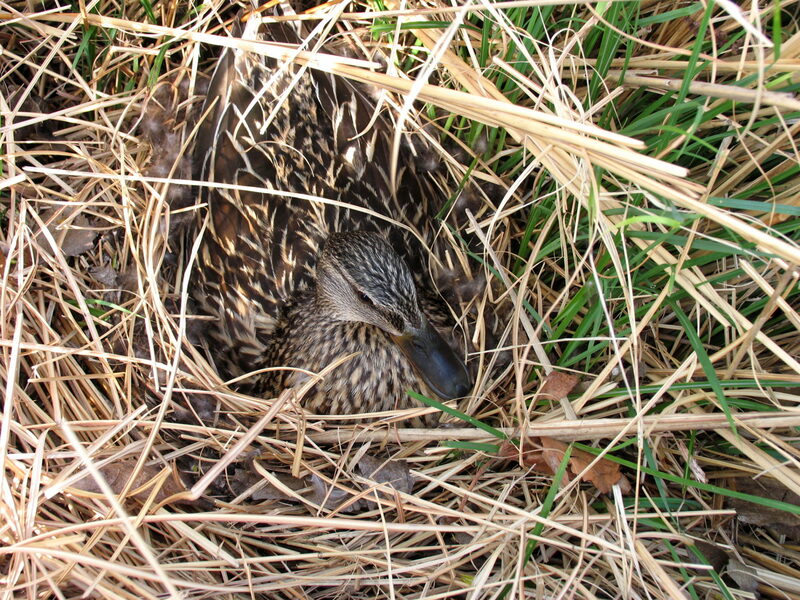 Tall grasses can be home to ground-nesting birds. Add a pond, even a tiny one (such as a half-whiskey barrel filled with water and a water lily), provides mating and survival habitat for frogs, tadpoles, and dragonflies. Create a toad shelter with a small “cave” of rocks. Or knock a large entrance hole in the side of a deep flowerpot saucer and lay it upside down in a damp, shady part of your yard. See more ideas here. At night and on cloudy, rainy or chilly days butterflies and moths tend to hunker down in natural crevices, such as between rocks or logs, under tree bark or even tall grasses. A butterfly house may offer another choice for them. They’re billed as houses for hibernation, too, but most butterflies and moths overwinter as pupae or larvae. Place the house near or in a butterfly garden, in a shady spot. Many charming styles are available at online stores or your local birdseed shop. They’re also pretty easy to build. See here for instructions. Note, however, that these often go unused, even when they’re “primed” with foods enjoyed by butterflies, such as banana slices or rotting fruit. Nevertheless, they’re a pretty ornament in the garden and thoroughly appreciated by spiders and wasps, which are essential, beneficial animals. Butterflies obtain moisture from such sources as streams, ponds, dew and standing water, as well as mud puddles. A shallow puddle of damp mud or sand in the garden — it’s not a pond, just keep it wet — appeals to many species. Look for them to gather around it especially in mid-day, when temperatures are hottest.